One of the first free firewall on the market, ZoneAlarm will protect your computer from hackers or nosy applications by controlling internet connections from your programs and blocking access to connections from the outside. You can block the traffic completly if you leave your station and resume at the press of a button. Comodo has gained a great reputation lately for its free firewall that is faring just as well as other more expensive options in many tests, they have also recently added an antivirus to their online security package. Comodo Firewall defends your system from inbound and outbound attacks. The application also features a Host Intrusion Prevention System to protect your critical operating system files and block viruses and malware before they ever get the chance to install. Jetico Personal Firewall protects your computer against hackers and malicious software when networked or connected to the internet. Three levels of protection are included: low-level network packets filtering, application-level network events filtering, and filtering of user-level process activity. Jetico Personal Firewall checks every packet that comes in or out of your computer and protects your computer from unwanted hacker's attacks. 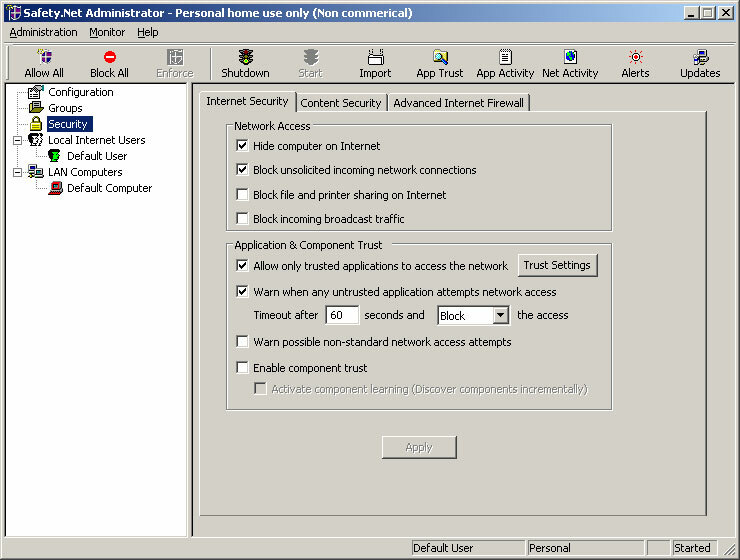 Safety.Net 3.61 offers Internet security, content security and advanced Internet firewall protection for all your LAN computers, and trust controls to block unwanted or harmful applications from accessing the network. You can define granular user or computer specific access controls based on site, content, PICS ratings and time of day. You can monitor connection level network activity round-the-clock and view detailed reports to analyze traffic and usage patterns.